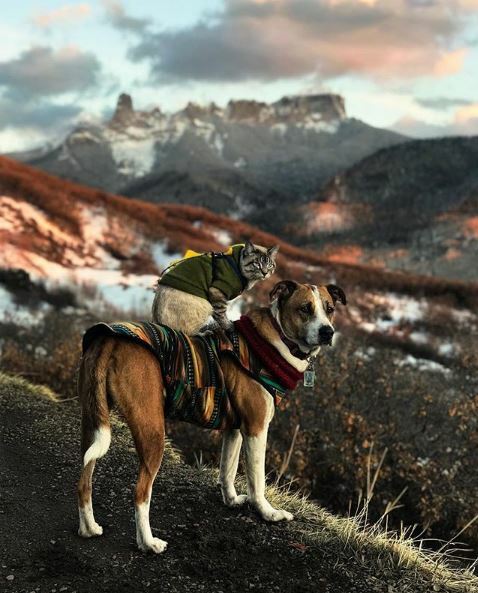 Since BaxterBoo is a Colorado-based pet supply company, we like to keep an eye on the local pet-related news, but Henry and Baloo are gaining a huge following on their Instagram (@henrythecoloradodog) that is touching the world. Like Bambi and Thumper, Timon and Pumba, and Mowgli and Baloo, Henry and Baloo seem destined for stardom in a Disney movie. 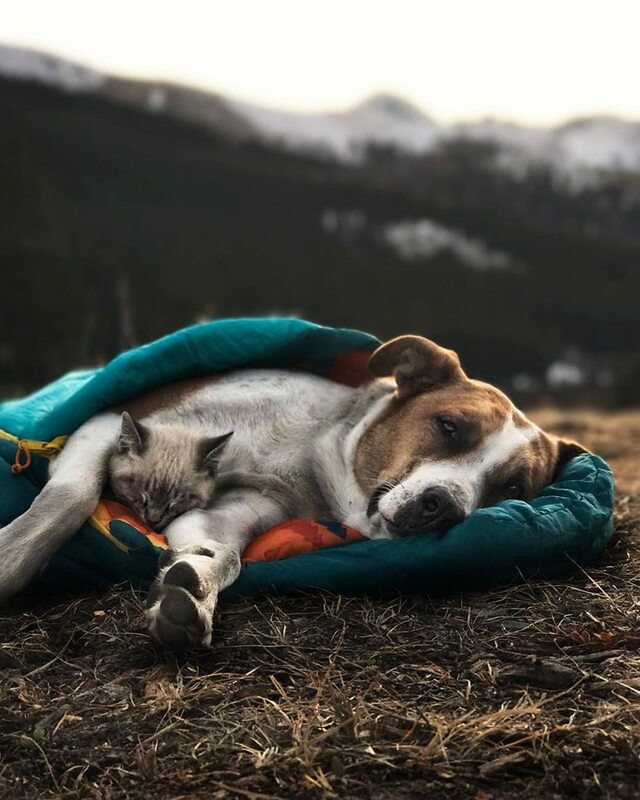 Indeed, the huge and unusual friendship between the lovable mutt and Siamese-mix kitty framed with stunning Colorado scenery seems too large for the small screens of our phones and tablets. 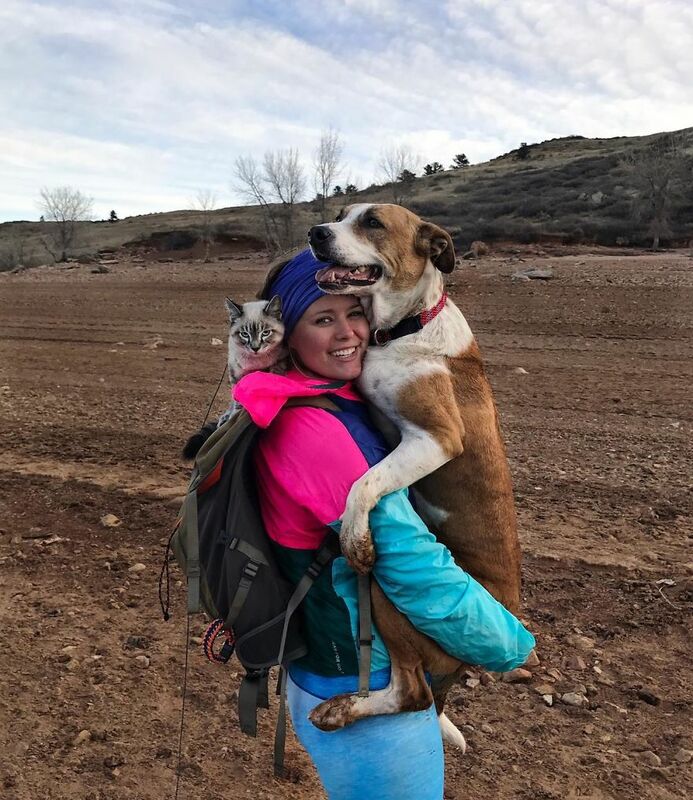 Cynthia Bennett and boyfriend Andre Sibilsky may not be Colorado natives, but their mutual love for the outdoors brought them to the Centennial state where they enjoyed hiking on weekends. There's nothing like bringing a little one into the family to make a house feel like a home. 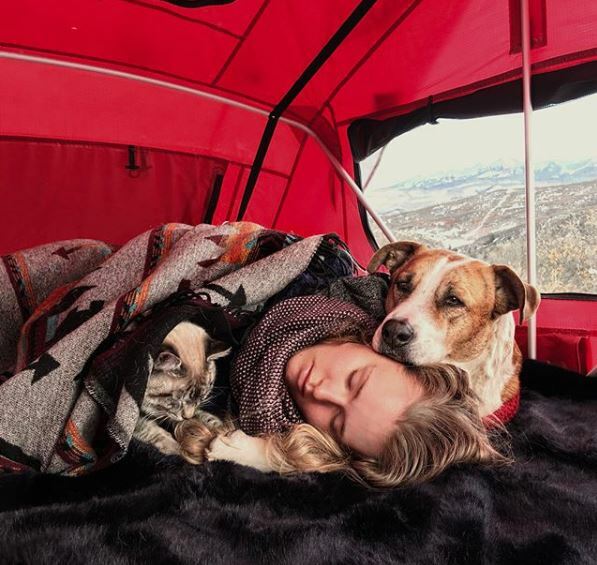 Like many modern young couples, this means adopting a pet. To do so, Bennet applied with the Rocky Mountain Puppy Rescue three years ago. For this foster-based rescue program, potential adopters peruse available dogs and puppies online before going to adoption events to meet them. Cynthia had her eye on a Golden Retriever mix, but when it was her turn to visit with the puppies, she saw a large and lanky puppy and just knew she had to see him. As soon as she got into the pen with him, he immediately climbed into her lap and went belly up. It seemed that he picked her, so they took him home. Cynthia and Andre took Henry with them on all of their outdoor adventures and were glad that he enjoyed the hikes as much as they do. As a Shepherd, Husky, Boxer, Aussie, and Staffordshire Terrier mix... all active breeds, he thrived with the activity. The unusual and attractive dog is very photogenic, and Cynthia noticed that most of her photos were of Henry. Eventually, she decided to start his own social media account on Instagram. While Henry absolutely loved his hikes on the weekends, the weekdays weren't nearly as fun. In fact, Henry was dealing with separation anxiety. Cynthia thought she should get him a friend. 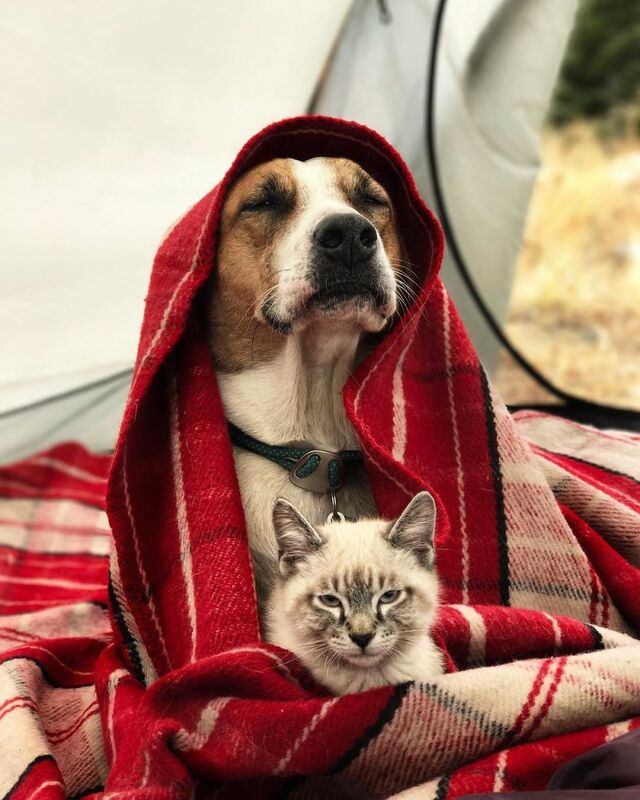 Inspired by other hiking cats on social media, Cynthia really wanted to get a rescue cat. She spent five months looking for a kitten that would be the right fit. Finally, in early the fall of 2017, they met a Siamese mix kitten named Baloo who was very outgoing but not overly rambunctious. As with Henry, Baloo immediately attached himself to Cynthia as soon as they met. As excited as Baloo was to meet Cynthia, he quickly bonded to Henry and always wanted to be playing and cuddling with the dog. Though Cynthia calls the boys brothers, she believes that Baloo thinks that Henry is his mom since she's witnessed him kneading Henry's coat and nuzzling him looking for a teat. Because of this, Cynthia also believes that Baloo sees himself as a dog. When meeting other dogs, Baloo instantly greets them. When seeing other cats, he appears indifferent. Not going to be left behind! It wasn't long before Baloo was asking to go along on walks. When Cynthia would grab Henry's leash, Baloo would be screaming all the way to the door. So Cynthia decided to work with Baloo on harness training. As it turned out, Baloo was a natural on walks. One day, Cynthia decided to plop the young kitten on Henry's back to see about taking a photo of the two of them. Baloo instantly hugged Henry's neck and head and made himself comfortable. And Henry just let him. Now it's a common pose for the duo. Now the family goes on many adventures together. 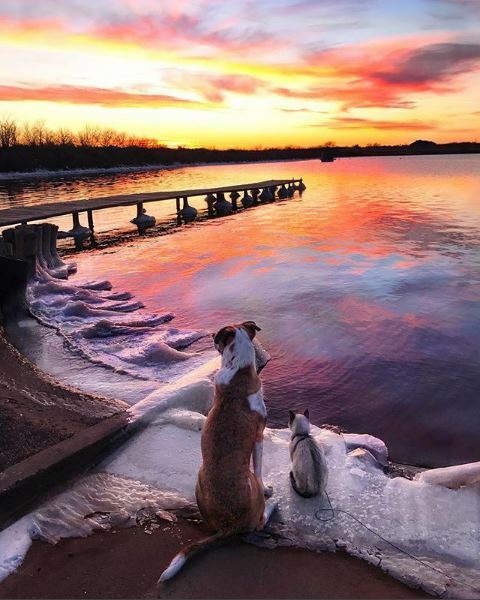 Though PawDad Andre has a regular job in finance, the popularity of Henry and Baloo's touching photographs have given Cynthia more freedom to do the travel and photography that she loves. As a Colorado native, it is lots of fun to see the different locations that the family treks to. The beautiful scenery reminds me of my childhood camping trips to the same places. 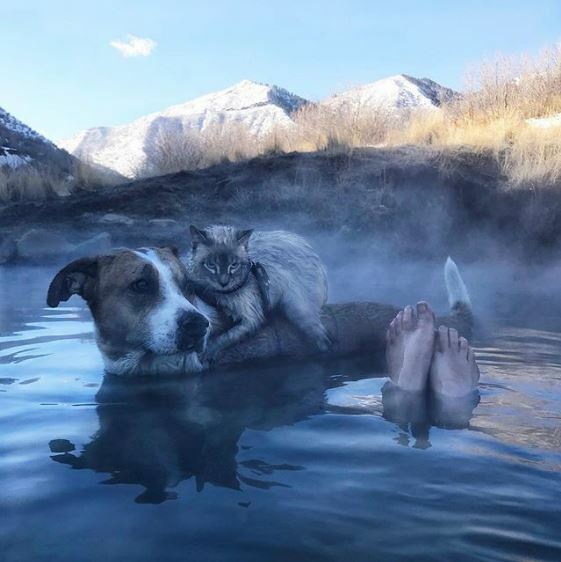 The authentic, warm images of sweetness between these trusting animals evoke the same innocent feelings I held as a youth - love, friendship, trust, dreams, and beauty. 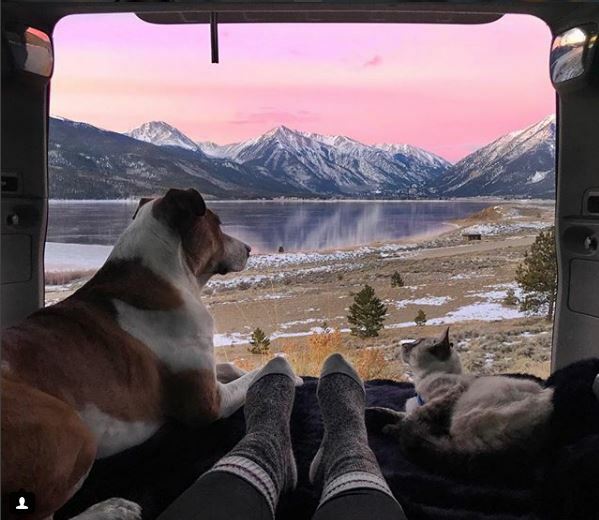 "A view with Baloo" Golden, Colorado. Note: Cats like sweaters too! 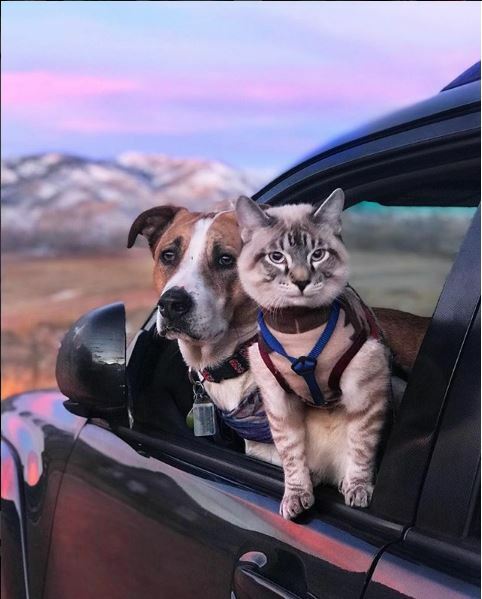 "Sunset watching is always better with your bestie by your side"
"The meowtains are calling and I must go"
If you've been waffling on whether you need an Instagram account, these photos should have convinced you. Now we just need a Henry and Baloo calendar, T-shirts, and yes, a Disney movie! On behalf of the Colorado Tourism industry, and pet rescues, we'd like to thank Cynthia Bennet and crew. On behalf of BaxterBoo.com, peddler of pet clothing, we also thank you! Henry and Baloo, you've made our hearts very happy! This entry was posted by Mary.